Drug abuse comes in many forms, from taking pills to snorting powders. Teen inhalant addiction involves sniffing common household products like solvents to achieve a high. Unlike drug abuse cases involving illegal substances or prescription drugs, inhalant abuse is much more insidious because the products that fuel the addiction can be purchased at any store and oftentimes without any restrictions. According to the NIDA (National Institute on Drug Abuse), inhalant abuse is highly prevalent among younger teens in the 7th through 9th grades. Ease of use and access contributes to this problem. The organization’s Monitoring the Future study also reports that 39 percent of 8th graders don’t think using inhalants is harmful, which indicates young teens don’t fully understand the risks associated with their behaviors. This type of abuse can seem harmless to teens, especially since the high achieved from sniffing inhalants is extremely short lived. While the effects of other drugs like amphetamines can last for hours, the effects from sniffing inhalants may only last a few minutes. To prolong the high, the person must continue sniffing the substance repeatedly, which can cause both temporary and permanent health problems. If you suspect that your teen is abusing inhalants or you think you may have an inhalant addiction, it is important to seek professional help as soon as possible. Call 1-888-287-0471	Who Answers? for information about inhalant abuse treatment options. Aerosols: These products contain solvents and propellants. Products in this category include hair sprays, spray paints and deodorant sprays. Volatile solvents: At room temperature, these liquids turn into gases. Products that contain volatile solvents include paint thinners, correction fluids and nail polish removers. Gases: This category includes commercial and medical gases such as nitrous oxide, propane and refrigerants. Nitrites: These inhalants are frequently used by older teens to enhance sexual encounters and include butyl nitrite, amyl nitrite and clyclohexyl nitrite. They are found in capsules that release vapors as well as in room deodorizers. A person who abuses inhalants may do these things repeatedly over the course of several hours. In drug culture, inhalants are known by various street names. Laughing gas, snappers, poppers, whippets and rush are all slang terms used to refer to different types of inhalants. “It is more likely, though, that teens who abuse inhalants will develop health problems that are potentially permanent and disabling.”Misuse and abuse of inhalants can endanger your child’s life. The American Family Physician, a peer-reviewed journal of the American Academy of Family Physicians, reported in 2003 that up to 50 percent of inhalant-related deaths were due to sudden sniffing death syndrome. The inhalant the teen sniffed caused his or her heart to suddenly start beating rapidly and erratically, leading to cardiac arrest. “When people are high, they often make poor decisions.”In addition to sudden sniffing death syndrome, there are other ways a teen can die from an inhalant addiction. One common way is by asphyxiation. The fumes from the inhalant may prevent oxygen from getting to the lungs, resulting in asphyxiation. 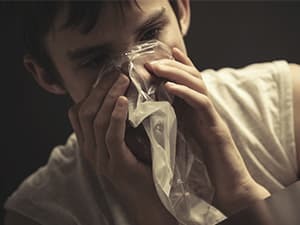 If the person consumes inhalants by putting them in a plastic bag and then putting the bag over his or her head, suffocation can occur if the bag is not removed in time. An inhalant may make the person pass out and choke on his or her vomit. When people are high, they often make poor decisions. This can lead to any number of fatal injuries. For example, the person may drive while under the influence or attempt to perform a dangerous stunt. Like other drugs, inhalants alter the thinking process and a person may die from self-inflicted wounds while high or coming down from a high. While treatment for inhalant abuse primarily focuses on changing the behavior, it may include the use of medication, depending on how severe the addiction is and whether withdrawal symptoms are present. Although treatment can be conducted on an outpatient basis, sometimes inpatient treatment is the better option because it completely removes the addict from temptation. Inpatient treatment also allows the individual to focus on overcoming the addiction without the distractions prevalent in most home environments. For more information about teen inhalant abuse and to find an appropriate treatment center, call 1-888-287-0471	Who Answers? .